True Beer Lovers are complex beings, possibly because they are human beings. Of these human beings, there are as many varieties with differing opinions as there are signatures of beer. This is what makes beer so ultimately interesting! It is to these beer-loving adults that Beer Radio, “the official Radio Show of the United States Beer Drinking Team,” dedicates each show. Monday Night Mike appreciates the simple things in life – football, hockey, baseball, basketball, soccer, cigars and beer-out-of-a-bottle. He loves his lager and his wife. He still thinks the Bud-Weis-Er frogs were the greatest creation on television and knows that his opinion is well respected in beer circles, especially among the Anheuser Busch crowd, and he’s right. Homebrew Herb and his buddy, Vector, are totally immersed in the chemistry and art of homebrewing, working long into the night on some complex formula for that next batch of Firehouse Porter. Strains of yeast, varietal hops and the exact ph of the water is of monumental importance as they struggle to duplicate the unique flavors of an obscure Belgian-style ale. Adventure-loving Anne-with-an-E enjoys hiking, biking, rock-climbing and outdoor activities that challenge her body and focus her mind. She works up a sweat with joy and exuberance, and likes to carry a thirst quenching brew-in-a-can for easy portability and environmental friendliness. European Yuri was bitten by the travel bug a few years ago and has discovered the camaraderie and freedom of beer trips – those tours to Europe, Canada or the Pacific Northwest specifically designed for beer lovers. He has traveled to England for the Great British Beer Fest, sampled Trappist ales at their source, and discovered the good-natured rivalry between Cologne and Dusseldorf, firsthand. Bottle-cap Bob belongs to the American Breweriana Association and has invested an enormous amount of his life in collecting beer labels, coasters, beer bottles and bottle caps. He knows their historical significance and has them organized as “specialized collections” – post World War II beers, those from the largest macro-breweries, and each differing segment, separated into its own corner of the brewing nation. Leisure Technician LLC is the home of the U.S. Beer Drinking Team, (also know as the USBDT), Beer Radio, Beer TV, Beer Hall of Fame, University of Beer and USBDT brand apparel. It is a product of the expansive vision of Dennis Buettner, President of Leisure Technician and Beer Radio Producer and Joe Gardenghi, CEO and Licensing Director of Leisure Technician LLC – a vision that focuses on you, the Beer Lover. It is almost inconceivable to think that there had never been radio entertainment specifically designed for those who love beer. 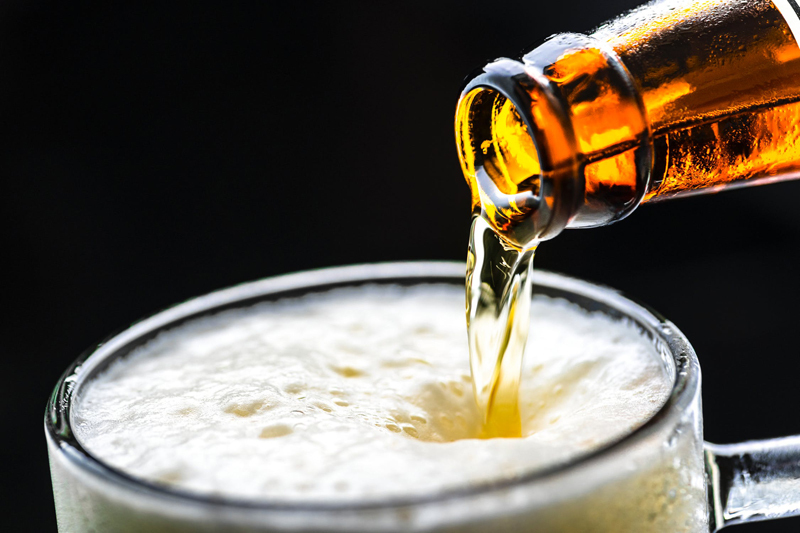 According to Beverage Marketing statistics, 2004 beer sales produced over $82 billion in sales revenue and paid-out over $5 billion in state and federal excise tax. Beer generates over 1.2 million jobs and the sale of beer-advertising has reached over $1 billion per year. The 90 million+ Americans who consume beer deserve respect for this monumental expression of their preference, one that far surpasses the glitz-and-glitter of the U.S. movie industry. First launched in November of 2003, Beer Radio is broadcast from the Infinity Broadcasting Corporation Baltimore/Washington Metroplex, and is webcast to the Military. Soon to be syndicated by Media America to seventy radio stations across the nation, the show is positive and upbeat – the polar opposite from the usual low-key attitude of NPR or CBC broadcasts. It takes beer seriously, stresses fitness and responsibility, and yet, sees beer as a source of high-spirited fun. The guest list is a diverse group: macro-brewers, corporate types, craft brewers, beer chefs, brewery entrepreneurs, homebrewers, and beer journalists. Beer Radio even has a beer anthropologist and a correspondent in South Africa. Since guests have no financial ties to Leisure Technician LLC, they tend to be more passionate about beer than the average bear, which makes for a better show. Beer Radio is a great way to kick back and relax, knowing that you belong to a magnanimous group of seriously fun-loving and diverse people with a common bond. It doesn’t get any better than that!